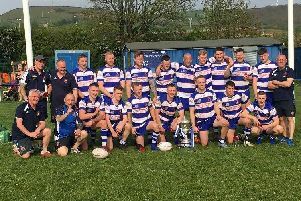 Illingworth St Mary’s and Sowerby Bridge continue to go great guns ahead of next Saturday’s Walton Street showdown. The pair are separated by three points at the head of the Spenser Wilson Halifax League’s middle section and seven clear of the rest. Both had easy wins with powerful batting displays yesterday, leaders Illingworth by 153 runs at home to Queensbury and Bridge by seven wickets at Clayton. Illingworth piled up 314-6 with James Lawton (87), Stephen Cook (82) and Daniel Murfett (81) all in good form. James Broadbent made 87 in reply but was the only visiting batsman to make a mark as Jamie Moorhouse took 5-45. James Holdsworth’s 82 not out settled matters at Clayton. Sowerby Bridge’s number five hit eight maximums and shared an unbroken fourth-wicket partnership of 112 with Joshua Wood (45 no) as the visitors overhauled their hosts’ 230-8, which included 59 from Danny Wilkins. Great Horton PC leapfrogged Bradshaw into third place courtesy of an eight-wicket home win over their rivals. Adam Spendelow made 72 in Bradshaw’s 177 all out but that was eclipsed by the home side’s Amaar Syed, who just got to his century before an eight-wicket win was clinched, finishing on 101 not out. Blackley were also convincing winners, by seven wickets, after Jacob Linsel (6-45) helped bowl out lowly visitors Stones for 155. Division One: Stones 155 (O’Rourke 47, Linsel 6-45), *Blackley 159-3 (Walsh 41): pts 2-12. *Clayton 230-8 (Wilkins 59, Evans 47), Sowerby Bridge 231-3 (Holdsworth 82*, Wood 45*): pts 3-11. Bradshaw 177 (Spendelow 72, Gill 4-37), *Great Horton PC 178-2 (Syed 101*, Hassall 42): pts 2-12. *Illingworth St Mary’s 314-6 (Lawton 87, Cook 82, Murfet 81, Shaif 4-53), Queensbury 161 (Broadbent 87, Moorhouse 5-45): pts 12-3. Points: Illingworth SM 60, Sowerby Bridge 57, Great Horton PC 50, Bradshaw 45, Clayton 37, Blackley 34, Queensbury 24, Stones 13. HAVING a handful of first teamers missing was no obstacle to success for Division Two leaders Luddenden Foot, who cantered to a nine-wicket win at home to Greetland. Five bowlers were among the wickets as Greetland subsided to 98 all out with Daniel Taylor (40) short of support for the visitors. Skipper Lee Broadbent (48 no) and Hayden Bruce (36 no) wrapped up victory in the 13th over of the reply. Mount are 10 points behind Foot in second after an 84-run win on the long trip to Old Town. Mahmad Gheewala (83) was among the runs again and Mahmad Kayat (60) and Rizwaan Abed (50) helped the visitors to 277-8. Imran Aslam (57) led the home response but Fakir Laher’s 5-38 kept Old Town in check at 193 all out. There were two more five-wicket performances at Outlane. The first came from Bradley & Colnebridge’s Andrew Mitchell (5-43) and the second from the hosts’ Toby Croft (5-57). However, the match-winning display came from Bradley’s Mark Mitchell. The prolific opener hit 95 not out, while seven teammates perished at the other end in pursuit of Outlane’s 123 all out, as the visitors won by three wickets. Leymoor’s Martin Allison (121 no) helped his side total 275-6 against struggling Cullingworth. The visitors were never going to top that but denied their hosts maximum points by making 115-9 with Tim Welsh (31 no) standing firm. Upper Hopton hope to return home next month, when delayed drainage work is due to be completed. In the meantime they are borrowing grounds and not doing too badly, Matt Broadbent hitting 40 down the order and taking three for 34 off 15 overs as they beat Low Moor by 74 runs. Points: Luddenden Foot 62, Mount 52, Bradley & Colnebridge 43, Leymoor 41, Upper Hopton 41, Old Town 38, Low Moor 28, Outlane 23, Greetland 20, Cullingworth 13.